Gordon MacQuarrie, was born and raised in Superior, Wisconsin. Following his graduation from UW-Madison in journalism, he became a cub reporter for the Superior Evening Telegram. He became its outdoors sports editor and managing editor until he joined the Milwaukee Journal in 1936. As it’s outdoors sports editor, he wrote popular columns entitled Right Off The Reel and Jack Pine Joe. He wrote articles on duck hunting, fly fishing and grouse hunting conveying the deeply emotional, lightly humorous, and fundamental philosophical aspects of hunting and fishing. He affecting readers so much his stories shaped their attitudes and lives. He wrote Gertie The Duck during WWII gaining him international notice and fame and later, a mini-biography on Ole Evinrude. For the Carry-Lite Decoy Company, he wrote a duck hunting handbook. 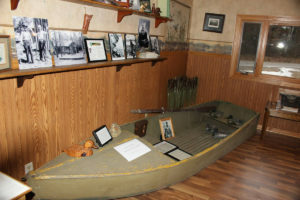 He coined the mythical Old Duck Hunters’ Association, Inc., using fellow hunters and fishermen as characters in his stories while writing from ODHA headquarters at his lake cabin on Middle Eau Claire Lake in Barnes, Wisconsin. His eccentric father-in-law, Al Peck, was his fishing and hunting mentor and entered his stories as “Mister President” and “Hizzonor” of the ODHA, Inc. Lake cabin neighbors became characters in his stories including dentist Dr. Patrick Tierney, best friend Paul Skamser, neighbor Oscar Ruprecht, and work colleague Bill Stewart. He penned personal outdoors sports stories of trout fishing on the Brule River, Merengo River and Namakagon River, and bass fishing on the St Croix River, duck hunting and grouse hunting on the Eau Claire Lakes, Yellow Lake, Nancy Lake etc., and the whole spectrum of the outdoors. His second marriage took place in Mineral Point, Wisconsin, where Paul Skamser was his best man. Harry Nohr of Mineral Point became MacQuarrie’s second Mister President of the ODHA, Inc. Mineral Point’s pioneer artist Max Fernecke painted MacQuarrie in a skiff typewriting. He had an “uncanny ability to make us want to join him in that icy November duck blind watching canvasbacks and bluebills slash into the decoys”. He “probably could have brought a smile to your face or a tear to your eye if he had written about paneling his basement”. A “masterful storyteller”, he “described his duck blinds and hunting sites in terms of what those places could do for your soul”. As the first fulltime sports newspaper outdoors writer his award-winning writing style helped raise the level of the entire field. He authored articles for national outdoor magazines as well as the newspaper, and his collected stories were compiled into books like Stories of the Old Duck Hunters and Other Drivel. MacQuarrie’s contributions were cut short by a fatal heart attack at the age of 56. He was the first communicator inducted into the Wisconsin Conservation Hall of Fame. In 1993, he was named one of the 100 Distinguished Alumni of the University of Wisconsin- Superior. In 1998, he was inducted into the National Freshwater Fishing Hall of Fame.. In 2000, the University of Wisconsin renamed a Douglas County wetlands the Gordon MacQuarrie Memorial Wetlands. His biography was published by Keith Crowley : Gordon MacQuarrie: The Story of an Old Duck Hunter . In a time when it was unpopular, he promoted causes of wildlife management, conservation, and environmental sociology. He was the first journalist to fearlessly write about wildlife conservation issues being influenced by a friend, Also Leopold, author of The Sand County Almanac, and the contemporary writings of Sigurd Olson.